The Royal Entomological Society (RES) and Wiley-Blackwell are proud to present this landmark publication, celebrating the wonderful diversity of the insects of the British Isles, and the work of the RES (founded 1833). This book is the only modern systematic account of all 558 families of British insects, covering not just the large and familiar groups that are included in popular books, but even the smallest and least known. It is beautifully illustrated throughout in full colour with photographs by experienced wildlife photographers to show the range of diversity, both morphological and behavioural, among the 24,000 species. All of the 6,000 genera of British insects are listed and indexed, along with all the family names and higher groups. There is a summary of the classification, biology and economic importance of each family together with further references for detailed identification. All species currently subject to legal protection in the United Kingdom are also listed. The Royal Entomological Society is one of the oldest and most prestigious of its kind in the world. It is the leading organisation for professional entomologists and its main aim has always been the promotion of knowledge about insects. The RES began its famous Handbooks for the Identification of British Insects in 1949, and new works in that series continue to be published. The Royal Entomological Society Book of British Insects has been produced to demonstrate the on-going commitment of the RES to educate and encourage each generation to study these fascinating creatures. 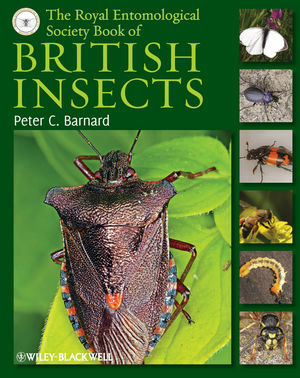 This is a key reference work for serious students of entomology and amateur entomologists, as well as for professionals who need a comprehensive source of information about the insect groups of the British Isles they may be less familiar with. Peter Barnard has enjoyed a lifetime's fascination with insects since early childhood. He carried out taxonomic research on several insect groups for over 30 years at London's Natural History Museum, where he edited the book Identifying British Insects and Arachnids (1999). In 2007 he was appointed Director of Science at the Royal Entomological Society, becoming the first full-time entomologist to be employed by the Society since its inception in 1833. "I have on my desk a copy of the newly published The Royal Entomological Society Book of British Insects by Peter C. Barnard, and it will make your head spin as much as anything Stephen Hawking ever wrote. It takes you through all 558 families of British insect; as a comparison, there are only 153 families of mammals in the entire world. It is a master-word of completeness; it includes 6,600 genera and 24,000 species – of which only 55 have protected status. As you look at insects you cease to see biodiversity as something weird or amusing or defined by collections. You understand that biodiversity is fundamental. It is nothing less than the way that life on earth works. Making more and more and more different kinds of things is the basic mechanism of life. You can reach this conclusion by turning to any page of this marvelous book."